North Carolina’s Town of Apex Mayor and Town Council recently eliminated barriers to solar photovoltaic (PV) system installations and implemented more solar-friendly policies, making the application, installation and use of solar more inexpensive, user-friendly and overall more feasible for Apex residents. In addition to the fee and stamp changes, Town of Apex also modified the system size limit for residential rooftop systems from 10 kW to 20 kW, made the Time of Use rate now optional for solar PV customers, and now allow customers to carry credit for energy produced as long as they maintain their account. In April of 2018, NCCETC’s Policy Analyst David Sarkisian, along with Senior Project Manager of DSIRE Brian Lips, reviewed Town of Apex’s published policies on solar – conducting a thorough review on rates, processes and permitting – and came up with a list of recommendations, of which the town council adopted a large portion. View all of the Town of Apex changes here. The U.S. Department of Energy provides additional details on how to purchase a solar PV system and take full advantage of the federal incentive program here. “We appreciated the opportunity to work with the [NCCETC] team on this project and will be relying upon the report David and the team produced to continue our work to provide leadership in terms of solar PV installation and use in towns and cities in North Carolina,” Havens said. 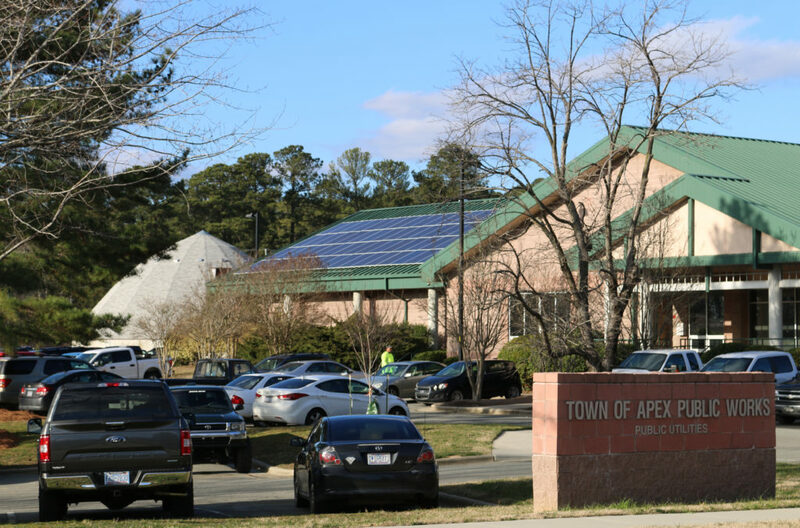 Currently, the Town of Apex is in the process of installing solar PV on ten municipal building after installing a 27 kW system on its Public Works building. Once the systems are installed via the project funded in the current fiscal year, the Town of Apex will have approximately 515 kW installed on its buildings. Havens said he and the Town of Apex hope to install more rooftop solar PV on additional facilities, in which they are partial owners through cooperative agreements with another municipality. Anne Tazewell, Special Projects Manager at NCCETC, also involved in the project, said she is excited about the results from the Center’s work and hopes the trend continues to more towns. “I think [the Town of Apex] can really serve as a leader and role model in North Carolina,” Tazewell said. Tazewell also said the Center is capable of and interested in continuing this same work on additional towns that are willing to consider implementing more solar-friendly policies, like the Town of Apex. “We hope that more local communities will look to the NC Clean Energy Technology Center to help them in their pursuit of increasing resiliency and reducing emissions,” Tazewell said. NCCETC has previously worked with the Town of Apex on the Community Solar for the Southeast Project and Solar in Your Community. View the Town of Apex’s current solar program policies and resources here.